Owl Babies by Martin Waddell, illustrated by Patrick Benson, is a well-loved children’s picture book that has been popular with the younger set for years. Owl Babies is this week’s featured book at the Virtual Book Club. We love being part of the Virtual Book club because picture books are awesome and thinking of book-inspired activities is so fun for us. We came up with three Owl Babies book extension activities for the kids. How do they feel when their parents are away? What helped them feel better? How can you help someone else when they feel worried and afraid? How do the babies feel when their mother comes home? Add movement with this Owl Babies activity. Have the kids act out perching on a branch. Can they fly like an owl? Can they swoop and soar? We had fun making Owl Alphabet Bottles. This activity is chock full of skills! 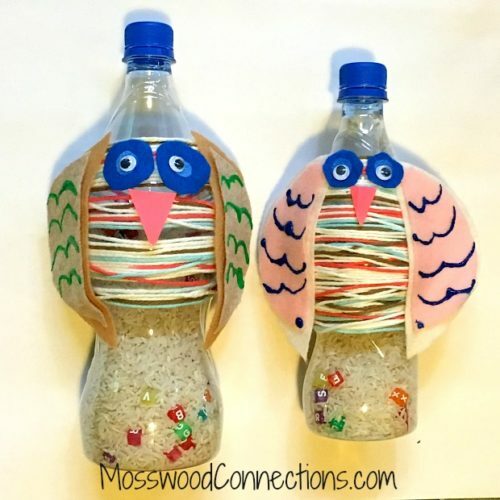 Decorating the bottles uses all sorts of fine motor skills and if you like you can add patterns in by having the kids use alternating colors of yarn. Then it turns into an interactive game that helps develop vision and reading skills. 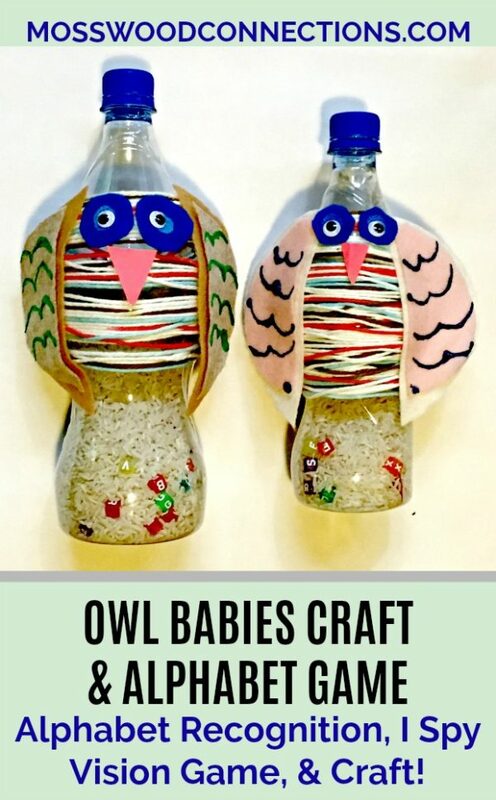 First, make the Owl Babies Bottles and then use them as an Owl Babies activities alphabet game. Cut out 2 large half circles and 2 smaller half circles for each owl. 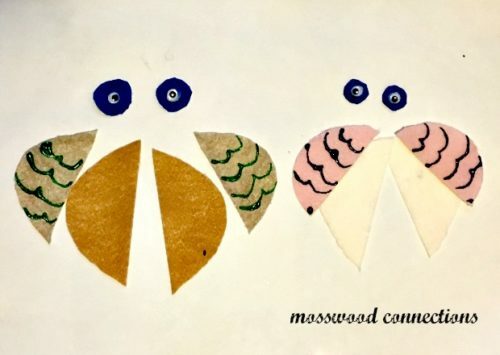 Cut out 2 circles for the eyes of each owl. Glue the smaller half circle onto the larger half circle. Decorate the half circles with the puffy paint. These will be the wings. Glue the eyes onto the circles that you cut out. Cut out a small triangle for the beak. While the felt pieces are drying, it’s time to fill the bottles. Using a funnel fill the bottles about halfway with the rice. For more fine motor practice you can have the kids make their own funnel. Add the alphabet letters. Make sure that you have the same letters in all the Owl Babies bottles. Make the body: Place a line of glue dots, mounting tape, or glue on the top half of the bottle. 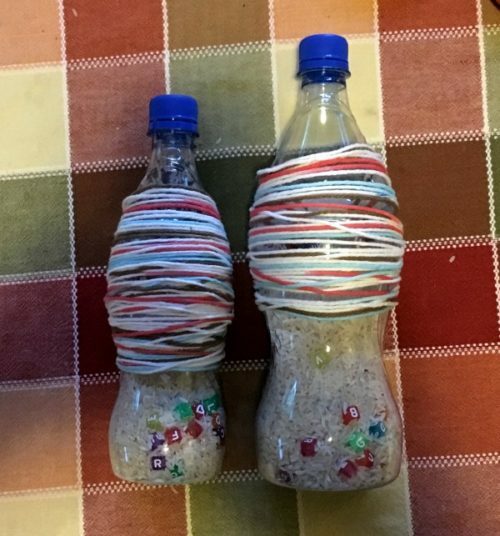 Wrap yarn around the bottle. Adhere the felt pieces to the yarn covered body. Now it’s time to play with the bottles. You can play it as a matching game. “Mommy owl finds the letter “A”. Can Baby Owl find an “A”?” Have the kids shake the bottles until they find the matching letters. Draw a letter and ask the kids to shake the bottles until they find the matching letter. Have the kids match letters to sounds. “Can you find the letter that says ‘p’? (make the “p” sound.) Have them find letters that they see in the book. can they find a “P” for Percy or an “S” for Sarah? You can even extend the learning by writing easy sight words on a card and have them find the corresponding letter. Make it a bit more difficult by giving the kids pictures of things that have easy to read labels like “cat” or “pot”, then challenge them to find the letters that spell that word. 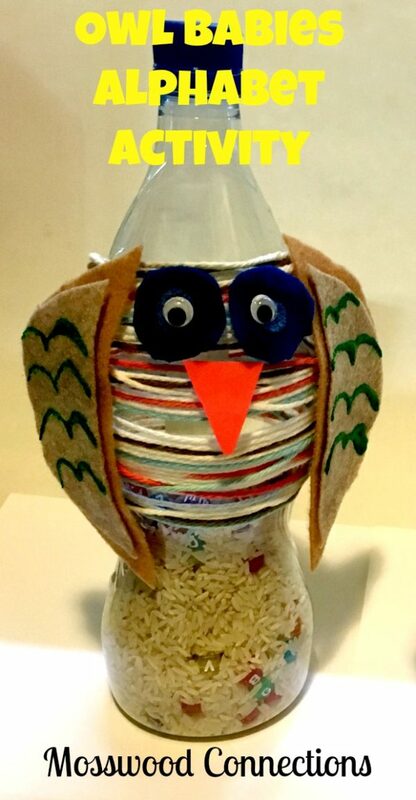 The kids will love their alphabet owls and there are endless ways to use them. If you want to try more of our picture book inspired activities then be sure to stop by our Picture Books Lesson Plans & Book Extension Activities Page.